So late this morning the Drumpster administration announced that the President had signed a new, improved travel ban. Not that there was ever anything wrong with the old one. This is, of course, an attempt to run around the various court orders from across the country the stopped implementation of the old Muslim ban. And no one used the words “Muslim ban” or even “ban” in the announcement, nor in the text of the executive order itself. I have actually read most of the executive order. It reads very neutrally, expressing no “opinions” other than the ones required by statute: e.g., that the President “proclaims” that this is all a good idea under various laws. It gives all kinds of background, including a somewhat accurate history of the orginal order, the history of how the six covered nations were either designated previously as “state sponsors of terrorism” or are currently dangerous places to be. It describes how caring the DHS will be as it studies whether to grant waivers to special individuals. At the same time, it justifies suspending “temporarily” all entry to reduce the workload on the poor workers at all of the agencies who would need to do extra investigative work while we “figure out what the hell is going on”. The order also goes to great lengths to try and cure some of the specific problems that were cited in the various court orders that stopped the original order. For instance, there’s a long list of exceptions for certain travelers from the six countries: dual citizens of other countries, green card holders, family members of permenant residents of the use, travelers with NATO visas, etc. It’s quite a long list. There is no mention of preference to religious minorities having preference. There’s accomodation for travelers who currently have valid visas. All in, a naive reader would think this was a clear-headed and rational response to a dangerous world. Except, of course, we know it’s not that. We all know that this is born out of the Dumpster’s long standing discriminatory bias against Muslims. We know because he said it a thousand times throughout the campaign, after his election, and when Ban Classic was introduced. We know it because one of the chief idiot Drumpettes, Rudy “Lock her up” Guilliani went on television and said he helped craft Ban Classic so it would ban Muslims, but not appear to ban Muslims. The order suspends all refugees from entering the country for 120 days, and reduces the number that will be accepted in 2017 to 50,000. I think this is the most problematic part of the entire fiasco. Refugees are, by definition, people who are fleeing from horrible situations – war, famine, persecution. They are helpless; they need help to simply survive. This country has a mixed bag about refugees. One of our origin stories, taught to every schoolchild every fall, is that the Pilgrems were refugees: fleeing religious persecution, they traveled to this country, where they found a safe place to live and were helped by the existing denizens. Every Thanksgiving play in this country features the Native Americans who helped the refugees from England survive. By the way, most of this is fantasy and didn’t actually happen like that – but the point is that we believe it to be part of our heritage. Another part of our refugee history is the shameful exclusion of Jewish refugees in the years leading up to World War II. As a result, an unknown number of people died at the hands of the Nazis. Why were they excluded? Well, the private reason almost certainly involved anti-semitism, but the public reason was that they could harbor spies and terrorists amongst them, since they were coming from Germany and other countries they controlled. Sound familiar? I accept that in admitting people from a war-torn region where there are many who harbor ill-feelings about the West and the US will probably allow a small number who go on to commit serious acts of violence in our country. I admit that some people already in this country might very well die as a result. But I wonder: where is our bravery? We celebrate those who take risks to save others: police, fire fighters, soldiers, sailors, the man who jumps in the lake to save a drowning child. We encourage our children to stand up to bullies and support others, even when it means that they may be hurt – physically or emotionally – in the process. Yet here is an opportunity for all of us to share in the risk – the risk that there might be some harm, while at the same time that we are guaranteed to save the lives of tens of thousands or more. Why is it that we are unwilling to take this small risk? I find it shameful and cowardly. Let me be very clear. I think we need to have secure borders. I think we need to take care of who is allowed into our country. I don’t want to die from a terrorist act, nor do I wish my children, grandchildren, friends or anyone to be hurt. But a policy born out of fear, hatred and bigotry still smells like a pig even after you put new lipstick on it. We must #Resist the ban. So for some unknown reason, the Trumpster finally acknowledged the existence of anti-Semitism, and expressed the view that it “is horrible and it’s going to stop and it has to stop”. He stopped far short of promising to do anything about it, as he has done with any number of other apocalyptic threats he sees in the US: Islamic terrorism, illegal immigration, environmental protection regulations, Meryl Streep, etc. 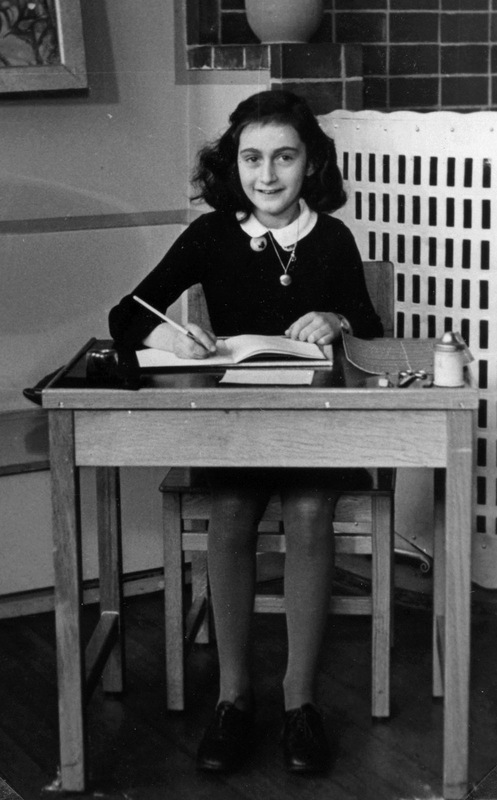 In case you didn’t know, Anne Frank and her family were denied visas by the US, in large part because the US government significantly tightened visa requirements because they believed that German refugees might be spies or terrorists (the Franks were German, although they had fled to the Netherlands by 1941). Sound familiar? “America is a nation built on the principles of religious tolerance and respect for all faiths,” she wrote. “We must protect our houses of worship & religious centers. #JCC”. Do you know what she’s talking about? If you’re not Jewish would you understand the hashtag JCC?